It’s time for The Card Concept #67 “Vintage” Challenge! 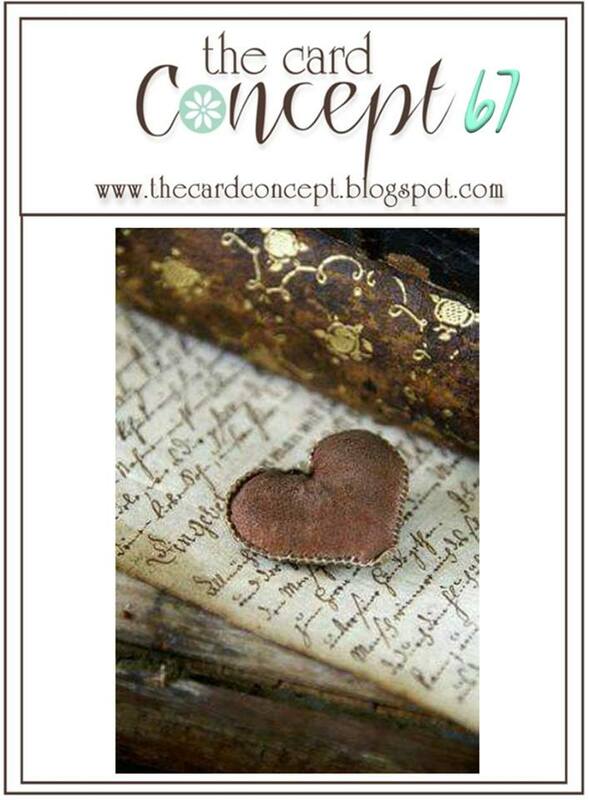 I love the vintage elements in our inspiration photo- the heart, metal tin, script background, browns as well as the gold! I decided to create a Mixed Media Shabby Chic card using retired Stampin’ Up! stamp sets, French Script and Friendship’s Journey. I love the vintage images and these stamps will remain part of my collection for years to come! 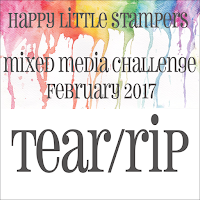 I decided to incorporate the Happy Little Stampers February 2017 Mixed Media Challenge “Tear/Rip” into the design. I hope you will find the time to check out the wonderful Design Team cards at The Card Concept as well as the HLS challenge gallery- gorgeous inspiration from all! 1). Ink the retired Stampin’ Up! 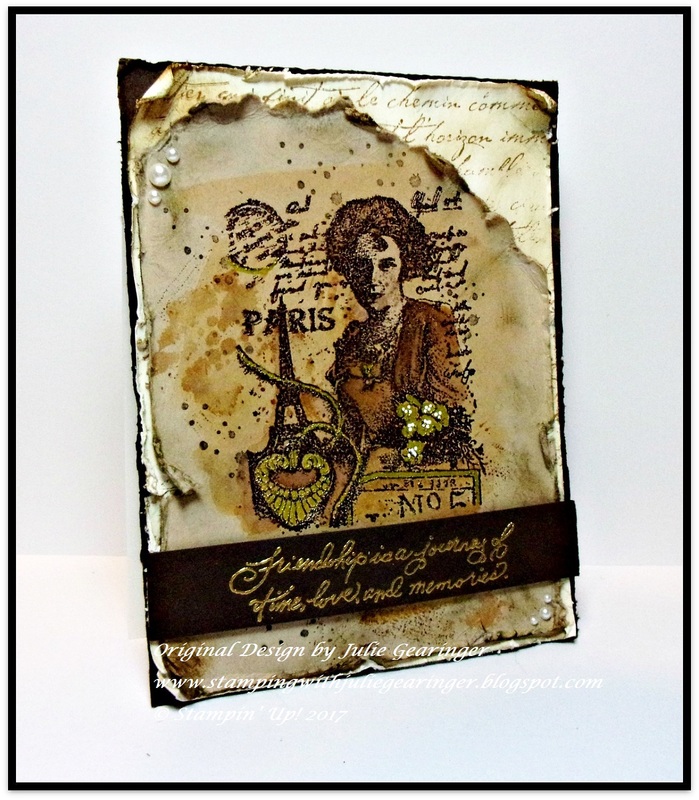 French Script background stamp using TH Ground Espresso Distress Ink, stamp onto a piece of Very Vanilla cardstock, distress the edges with a distressing tool and apply TH Vintage Photo Distress Ink with a sponge dauber over the edges. 2). De-static a piece of Crumb Cake cardstock with an Embossing Buddy®, stamp the retired Stampin’ Up! Friendship’s Journey image with Versamark™ Ink onto the prepared cardstock, apply Stampin’ Emboss® Early Espresso Embossing Powder and heat set with the heat tool. Once the embossing has cooled, water color with TH Brushed Cordoruy, Walnut Stain and Vintage Photo Distress Inks and apply TH Tarnished Brass Distress Stain to the heart, locket, flowers and other areas. 3). Hand tear around the entire panel, sponge additional TH Vintage Photo Distress Ink over the edges and mount onto the distressed script panel. 4). Mount the entire panel onto a piece of Early Espresso cardstock, distress the edges with a distressing tool before mounting onto the white card base. 5). De-static a piece of Early Espresso cardstock, stamp the sentiment from Friendship’s Journey with Versamark™ Ink, apply Stampin’ Emboss® Gold Embossing Powder and heat set with a heat tool. Trim the panel and mount onto the card front with dimensional foam. 6). Use an Extra Fine White Sharpie® Paint Pen to add white highlights to the flowers and finish off the card with a few pearls. Thanks again for taking the time to stop by! I hope all of you have a wonderful week and you will be able to join us for the #67 “Vintage”Challenge at The Card Concept! How beautiful! I love the gold...the pearls....so pretty! I've always liked this stamp, but have not used it in a while. You have inspired me to get it out and make a card. Lovely example of shabby chic. I follow your blog. Thank you. Wow! I love this! 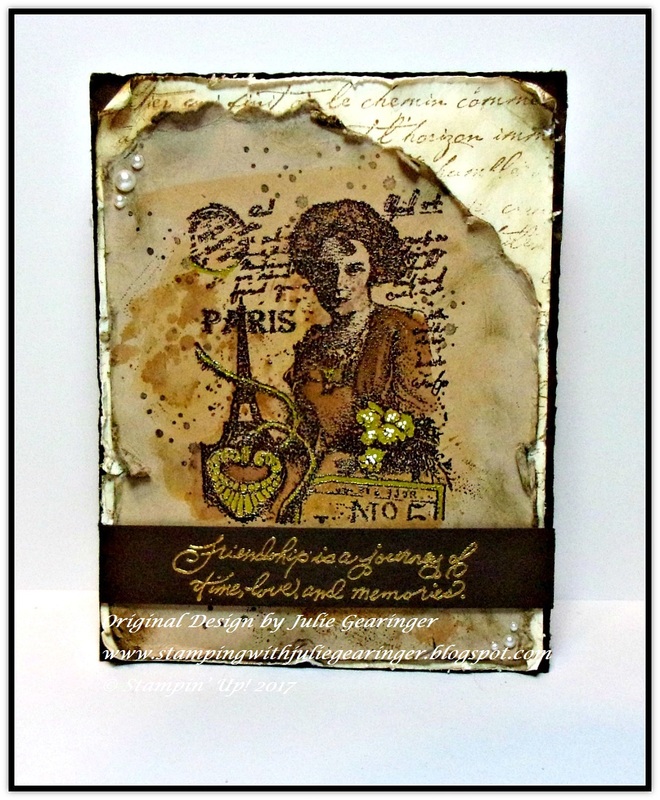 This has a truly amazing distressed and vintage feel! It's like I'm looking at something that's been saved for 100 years. You did an AMAZING job creating this! This is a lovely creation, Julie. Super stamp and gorgeous design. Lovely vintage look. Thanks for playing along at Happy Little Stampers Mixed Media. Fantastic vintage themed card Julie! Love the image and the script background! All the distressing adds such a nice touch! Thanks for the inspiration! An incredibly gorgeous image Julie. I love your curled distressed edges and gold embossing. Awesome vintage card! I love how you highlighted that fabulous image with the scripted paper and the curled edges! Hi, Julie! 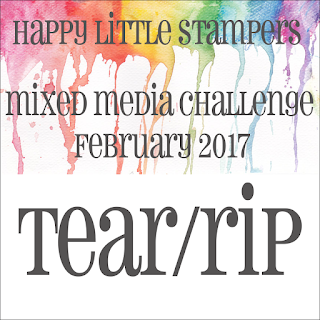 Congrats on your win at Happy Little Stampers MM challenge for February. If you are interested, please contact me about Guest Designing for us. You can email me at melissadawnlane at hotmail dot com. Thanks! Welcome to the Artistic Outpost February Release!